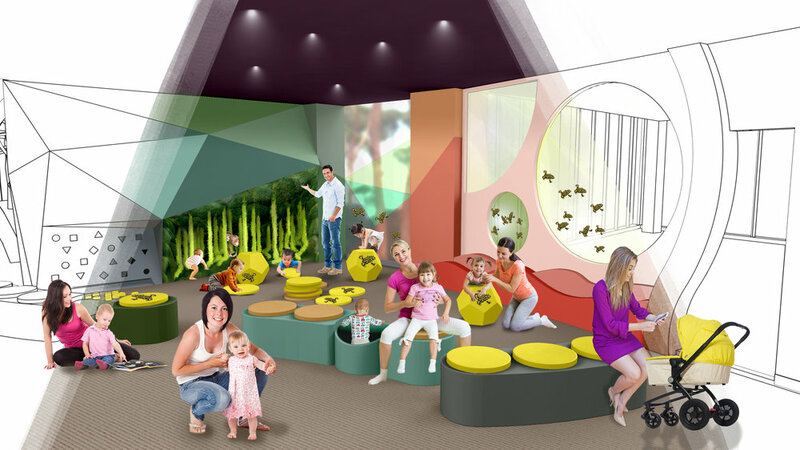 Arterial won the opportunity to design and develop a new centre at the National Museum of Australia in Canberra, which will open its doors to children and their carers in early 2020. The new centre connects children with stories and objects that represent the full facet of the Museum’s Collection. The design offers a voyage of discovery for children, where they can explore, have fun and learn through play. As well as an innovative play space, there is a mini makers space that offers changeable creative learning opportunities for young audiences and a programmable workshop space designed for older children and visitors of all ages. The overarching framework for the design of the play space is a deconstructed 18th century sloop, inspired by Matthew Flinders circumnavigation of Australia in HMS Investigator. This “ship” inhabits the entire playspace through the use of architectural ribs, portholes and climbing structures. Animations, told through the portholes, transport visitors into six different stories and environments. Each of the six stories features a different Australian animal or mythological creature. The stories are reinforced through full-body interactive play opportunities which encourage the children to become and empathise with, the characters while acting out physical challenges. Arterial's design engages participants to access the narratives at an emotional and a physical level. They are involved with the drama and passion of the content, as they experience the stories for themselves. The desired outcome is that, through play, hands on making and exploration, a greater connection is made between children, the Museum's Collection and greater Australian stories. As children grow and develop their interests, they will return to the Museum and build on these early connections while visiting other exhibits in the main Museum.